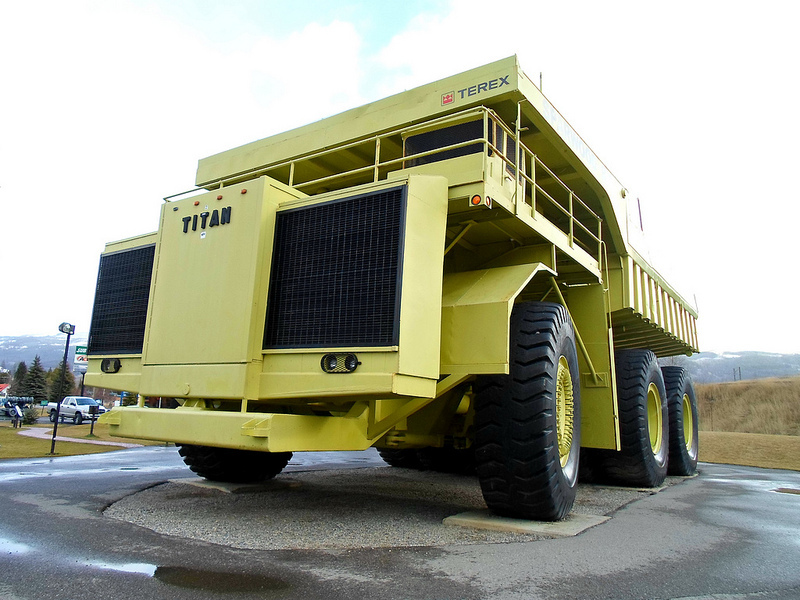 Since it is big truck week here at Curbside Classic, I thought I’d bring out the biggest classic of them all: a 1973 Terex Titan 33-19 dump truck that weighs in at a hefty 260 tons when empty. It has since been eclipsed in capacity but in terms of size, it is still the big dog. The Titan 33-19 was assembled in London, Ontario, Canada by Terex, which was a subsidiary of General Motors at the time. This particular truck was the prototype of a proposed model run. Perhaps the market for these mega dump trucks wasn’t as robust as expected because production never materialized. 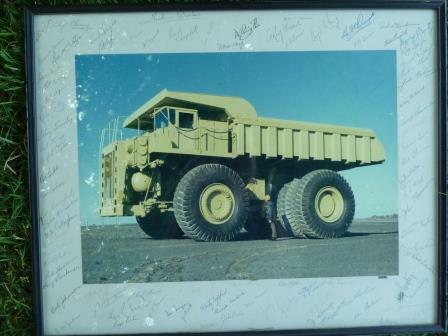 It did, however, hold the record for largest capacity dump truck from 1973 to 1988. The specifications of the Titan are truly impressive, but to really understand them better we should perhaps compare with something a bit more familiar. Let’s use the well known and often used automotive benchmark that is the first generation Suzuki Cultus/Suzuki Swift/Chevrolet Sprint/Pontiac Firefly/Geo Metro/etc/etc. The Titan, with a length of 20.09m (65’11”), is equivalent to 5.4 Swifts. The height of 6.88m (22’7″) is almost exactly five Swifts tall. The Titan is a mere 4.8 Swifts wide however. Weight is what really sets the Titan apart from the little Suzuki: the three door hatchback weighs in at 1,650lbs, but the Titan comes in at 520,400lbs (236,053kg). If my math is correct, that is the equivalent of 315 Suzukis. Plus with the Titan’s 700,000lb (317,520kg) payload, one could haul the equivalent of 424 Swifts. To power this big and heavy beast, a two stroke, turbocharged 169.49L (10,320 cid) V16 diesel engine generating 3300hp @ 900 rpms is fitted. 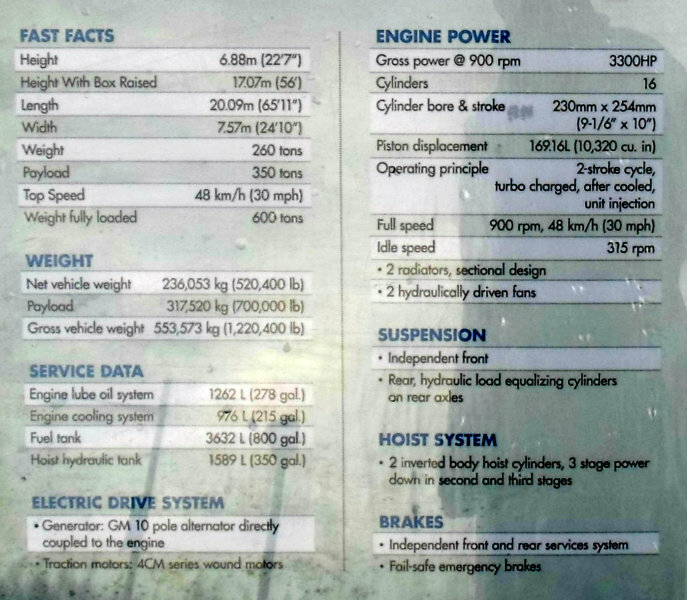 Let’s again compare to our little Suzuki with its 1.0L three cylinder engine. Each Suzuki cylinder has a bore of 73.9mm, compared with 230mm for the Titan. Stroke is 77mm versus 254mm. The Suzuki undoubtedly has the upper hand with fuel consumption as the Titan consumes 265 liters/70 gallons per hour; good thing the fuel tank holds 3232 liters/800 gallons. The car also beats the truck on top speed, as the Titan 33-19 tops out at 30mph or 48km/h. The Titan’s engine (most commonly used in locomotives) is sourced from the GM’s Electro-Motive Division and is used to generate electricity for four 4CM electric motors. The engine puts out enough electricity to power 3200 homes according to the informational plaque. Interestingly, this big truck has independent front suspension. 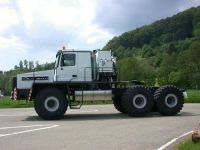 This rather rebuffs those who like to argue that their three ton truck absolutely needs a solid axle at the front. The brakes are also independent front to rear, likely to help with steering. The Titan rolls on 12′ tall tires. I actually saw this exact truck in service at a mine near Sparwood, British Columbia during my childhood. We visited the strip coal mine operation where this truck resided and where a fleet of more modest (but still massive) two-axle Euclid dump trucks were in use alongside the Titan. The Titan started its work life in Eagle Mountain, California at a Kaiser Steel iron mine. 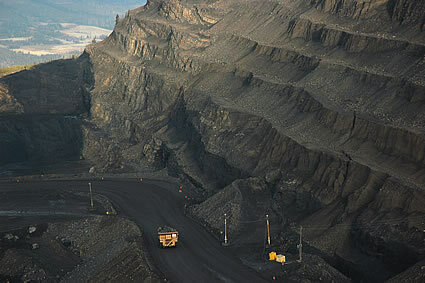 By 1978, it was moved by rail to Sparwood, British Columbia to haul coal. It was fully retired in 1991 due to the high cost of maintenance, no doubt because of its one of a kind status. 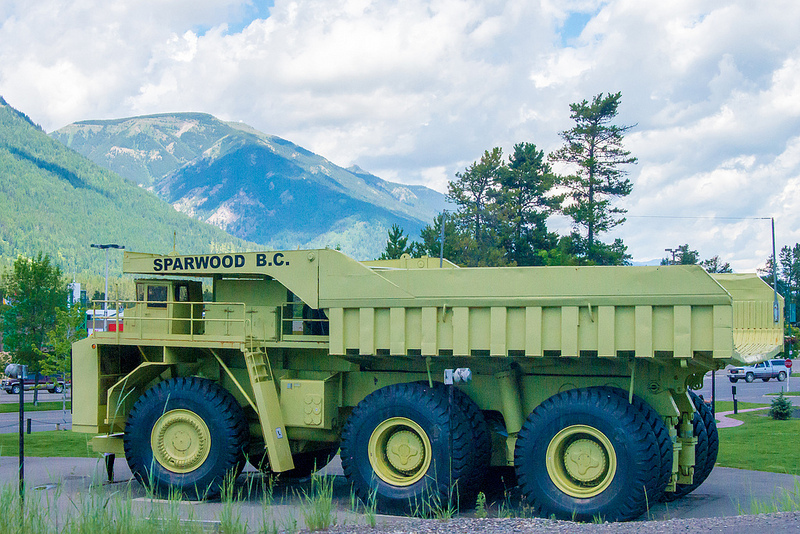 Teck Corporation acquired the Sparwood mine in 1992 and provided the Titan for public display. A restoration (and engine removal) followed in 1993 and it now serves as a tourist attraction for the town of Sparwood, just off Highway 3. As an extra bonus, this Wabco 3200B Electric Haulpack mining dump truck is a similar but smaller display in Logan Lake, British Columbia. Our old family minivan stands in as a nice size comparison. The specifications are impressive, but overshadowed by the Titan. 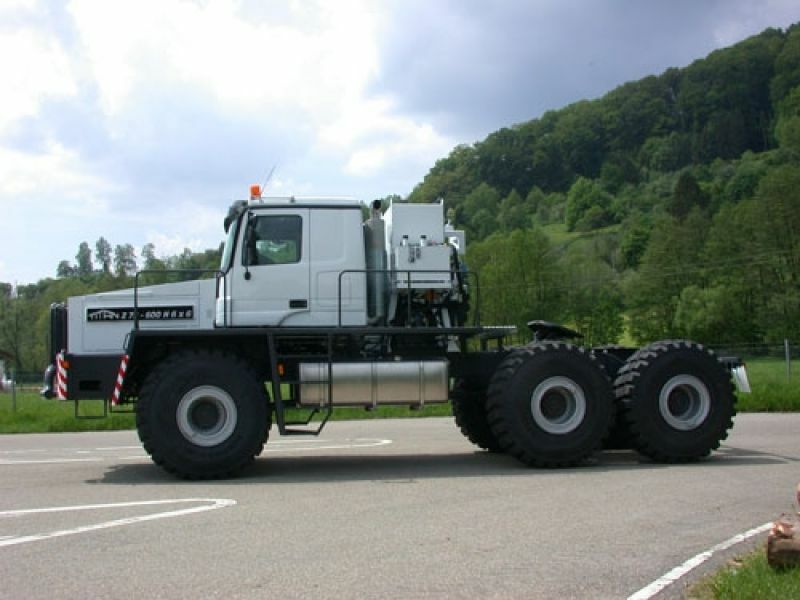 These monster sized trucks have been eclipsed in carrying capacity, but newer trucks use two axles rather the three used by our two examples. It is nice that in the face of high scrap prices, both these trucks have been preserved as tourist attractions. There are a few big Terex and Euclid trucks running around at the U.S.Silica plant in Mapleton Depot , PA ( just of US Route 22 ). I thought thosae were huge , I can’t imagine how this thing sizes up in person ! The Terex Titan, built by the General Motors Canada Diesel Division plan in London, ON was a proto type. I worked for Blackwood Hodge in London, ON branch who were Terex dealers across the world. Visited the production line a few times while the Titan was being built. Since the GM electromotive train engines were a production item at the London plant the Titan was a good fit to be built on the same production lines other Terex products like smaller off-road trucks and front end loaders where being built. I have a large picture of the completed Titan with the signature of most of the people who were involved with its assembly. I remember when it was broken into several pieces to load on rail cars to move it to its first job site. Also remember the 1970s General Motors ads with Jack Nicklaus hitting a golf ball out of the box filled with sand to resemble a sand trap. Also with 9 compact cars sitting in the box 3×3. Most recent figures of highest payload and total mass among mine trucks refer to ‘2013 BELAZ 75710: 450 metric tons / 500 short tons and 810 tons respectively . I’m surprised this thing is preserved. Think of how many I-somethings can be made by Chinese kids out of this! Perhaps because it was retired in more recent times but at a time when scrap prices were a lot lower? In Darwin there a couple of large WWII guns that were sold to the Japanese for scrap in the early 60s, from a bid that was only slightly higher than one from a local who wanted to preserve the guns as an historical monument. From what I have seen, most of this really big rigs are “hybrids”. What are the advantages of this instead of just using the diesel engine to directly drive the wheels? I’m sure that the main factor on this truck was the existence of a proven powertrain combination that was available, and had been around along enough to have the bugs worked out. When you factor in the cost and complexity of trying to design and build either a clutch or torque converter that can deal with this much torque, it would be a no brainer to use the loco drive train. Clutches or torque converters would be far more expensive too. I rode on a train that had a diesel engine with a clutch and gearbox – the company had to revert back to the steam engine that it was intended to replace. It just couldn’t deal with the initial start from stationary when heavily loaded on a gradient. The mechanical-electric system used on the Terex and locomotives don’t require mechanical clutches, torque converters, or gears. Hydraulic drive has been tested in similar applications, but the robust nature of the mechanical-electric systems has been excellent. First designs used generators with Direct Current. Late model systems use Alternator/AC architecture. Make sense. Why reinvent the wheel when you already have a proven and reliable drivetrain? Plus all that torque from 0 RPM doesn’t hurt. Im pretty sure that batteries don’t play any significant role on these. A ‘hybrid’ would rely on the engine to directly drive it at least some of the time. The engine also charges the batteries which can either lend electric assist or run it entirely on a limited basis. Diesel-electric submaries are technically hybrids, based on that. This is a much simpler setup. As others have said, its basically using the electric motor to drive it 100% of the time, there is no mechanical link between the ground and the ICE. Like a locomotive, it has its advantages since its very precise and can get a large load moving in a very controlled fashion. As some others have said, it is amazing that someone spent the money to restore this one rather than to sell or scrap it. I would hate to have to change one of those tires. Do you suppose tires like these are made to order? They are certainly not at Costco. From what I remember from the tour as a boy they are custom made and fantastically expensive. Any idea how long do they last? I assume they are air filled…? Personally, I refuse to shop at any place that makes me pay a membership just to buy something. I know it can still be a good value, it’s the principle of it. I agree with you there that is why I go to WinCo. The tires currently on a couple of our vehicles are from Costco, but I’ll never buy tires there again. Their tire shop is too much of a PITA to deal with. The hassle can’t be worth the savings. They probably wouldn’t even sell me tires for my Chryslers, since they don’t have a size listing in their computer…. not like I’d ever let their guys near my left-hand lug nuts with a wrench anyhow. And even their regular installed prices is hard to beat. I don’t think that’s right, that’s only about 1HP per home. Even a 5 HP generator can’t power an entire American home. Still an iimpressive piece of machinery though. Enjoyable article and photos David. I had no idea this was built in Canada, let alone London, Ontario. I remember it being a fixture in the Guinness Book of World Records for years. The restoration does indeed, look outstanding. Thank you! This “Big Truck Week” is laying a H U G E egg and is about as enjoyable as a Firestone Steel 500 radial tire blow out. I would not respond to them, it encourages them. I know a guy who used to work for Highland Valley Copper near Logan Lake BC. He was in the service/maintenance dept. at the time. He said they used to service these trucks “on the run” so to speak…meet them out on the worksite to refuel and fill with oil/coolant etc. If a truck was say, leaking oil they would just make sure to fill it up more often rather than pulling it off the job which was very expensive down time….they run them 24/7/365! Terex used to be headquarted in my hometown (Hudson, OH), but unfortunately this beast wasn’t built there. That huge site and manufacturing facility is now the HQ for Jo Ann Stores (Jo Ann Fabrics). There are 1-2 smaller tennants on site as well, but much of that factory is still standing, but being used as warehouse space rather than manufacturing. My wife deals with Jo Ann quite a bit in her fabric business – she’ll get a kick out of that. I was wondering when we were going to get to the Titan, I’ve always wanted to see this beast in person, I remember a promotional photo from when the Titan was released that had the bed tilted with 6 or so GM cars from the era in the bed, there was a Cadillac, a Cutlass, a Chevette, and some others, it must have been from a trade show somewhere. The Terex Division was an off shoot of GM’s Euclid Equipment division created in 1968, when Euclid was prohibited from selling earthmoving parts and equipment for 4 years due to an anti-trust lawsuit from the US Government. 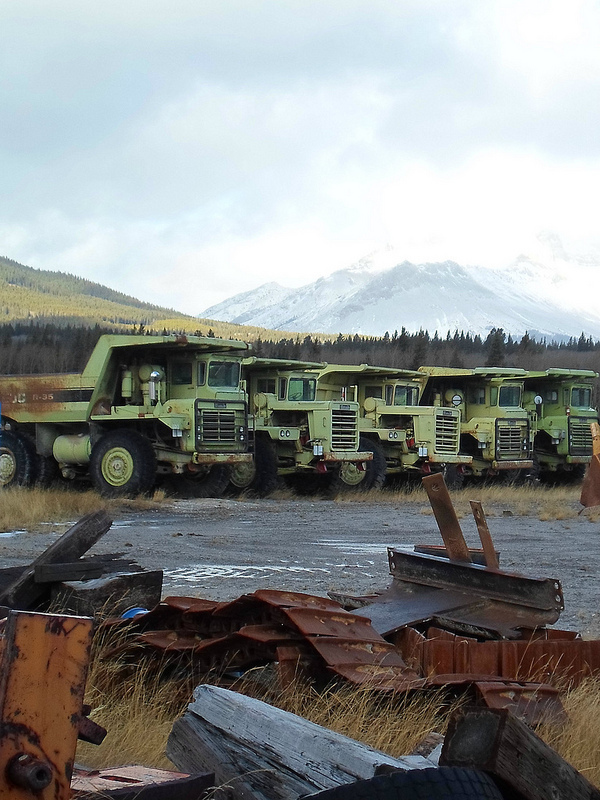 There still are a good number of 70’s and 80’s vintage Terex trucks in service in Alaska, their bright green color is easy to spot. Wow, that’s huge! I just looked-up Sparwood, BC on Google maps. They show the location of the Terex Titan right on the map, but it is mislabeled as the “Texas Titan”. Titan is of course a great name for a (big) truck model. Krupp Titan, Terex Titan, Nissan Titan and Mack Titan. Maybe more. There’s also a truckmaker Titan, now owned by Mercedes. Heavy haulage tractors, like this one. Looks to be the same company that made this truck. Great shots! I’ve driven by this truck many times and always wondered if the claims about world’s largest truck are true. Sparwood is coal mining country, there are 5 large mines close by and transport trucks loaded with tires and attachments for the equipment are common sights. 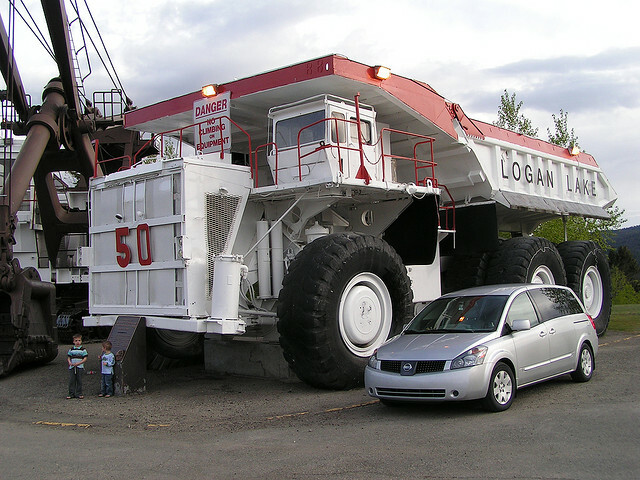 Almost always oversize loads with pilot cars etc., but nothing as big as this. 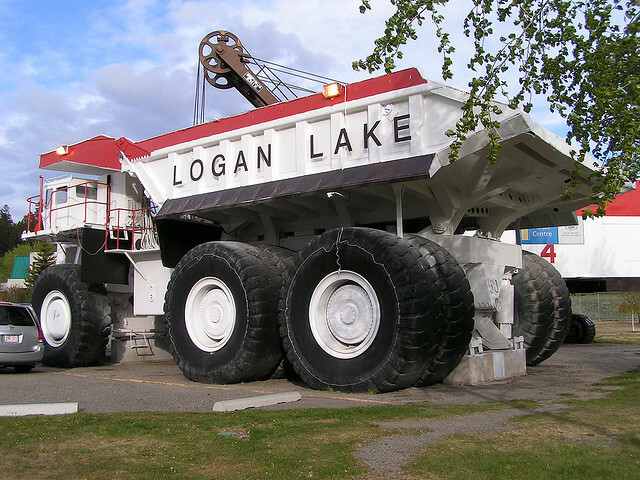 I’d forgotten about the Logan Lake truck, it would have come from Highland Valley Copper which is the biggest copper mine in Canada if I’m not mistaken. Very cool. I love monster equipment like this. 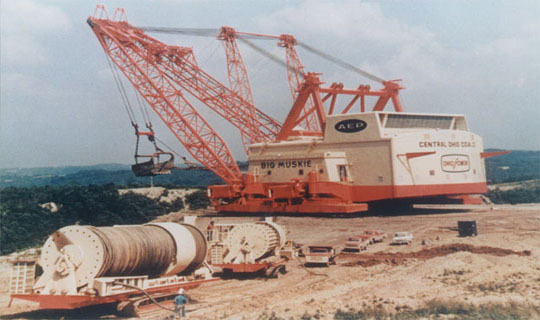 We used to have the world’s biggest dragline here in Ohio, Big Muskie, but it was scrapped some years back. The only part left is the bucket which is a roadside attraction. The truck was saved from scrap by the efforts of the Sparwood Chamber of Commerce and the Knights of Columbus…and the willingness of Teck to donate it.As a one off piece of mining equipment on public display it has attracted visitors from all over the world….35000 visitors a year stop by our visitor center and it is the main attraction.With assistance from Terex and the District of Sparwood we were able to give it a fresh coat of paint last year.As noted,the original motor is gone but we are hoping to locate another 16V149T to put on display beside the truck. Think I saw an episode of the Science Channel’s Television Show “How It’s Made” that featured these behemoths – fascinating. I worked for marmoraton mining co in ontario we had a terex proto type hauler 135 i think but single axle from 1977 to closing mine in 1978 1500 loco engine 1500 hp . Fairbanks morse switch gear drove itmanytimes . Dumped load into primary crusher iron ore 300 tons in winter never shut it down or needed portable aircompressor to turn over engines twin air starters we also had 7 sicard dart 105 ton trucks with cat engines , general electric switch gear and genaral electric rear drive axles with air over hydraulic brakes besides dynamic brakes me and three other mechanics diassembled these trucks for shipment to a coal mine in the u.s.a. in 1978 after mine closed .